Click this LINK to join the Blog Hop! 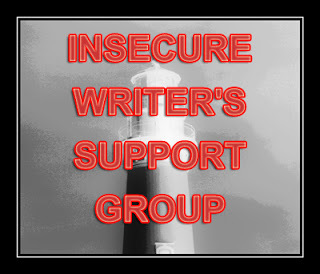 I’m participating in the Insecure Writer’s Support Group Blog Hop. This is my first post. What am I insecure about? Mostly of what/where/when to promote. I’m an indie author and all marketing is on my shoulders. I’ve tried a plethora of avenues: ShoutLife, Twitter, Facebook, LinkedIn, GoodReads, Google Plus, forums, interviews, emails, book signings, newspapers, book trailers, business cards - and this is only the beginning. Plus, I’m also supposed to find the time to write. And in the meantime life happens. Such as my husband being diagnosed six months ago with parathyroid disease. I’m curious. How many of you have heard of this? I hadn’t. Thyroid disease, yes, but not parathyroid. For years he complained of extreme exhaustion, mental confusion, grogginess. Last summer he knew something was wrong other than just ‘growing older’. Since there were still several months until his yearly checkup with the VA doctor, we visited a walk-in clinic. Labs were performed. The nurse practitioner made the statement, “Your blood calcium is a little high but it appears your thyroid is a bit out of whack.” She prescribed medication. The symptoms remained and my husband felt no better. When the time came for his annual with the VA, the doctor noted, “Your calcium has risen for the last three years that I’ve seen you. Let’s take more tests.” A chest x-ray was ordered, an EKG, a 24-hour urine specimen. This alerted me that obviously too high blood calcium was not a good thing so I went searching on the internet. And sure enough, the doctor confirmed what I learned - the culprit was more than likely a tumor on one of the parathyroid glands. The diagnosis meant even more tests. A bone scan/density, ultrasound, nuclear medicine. And the tumor was found on the lower right side of his neck. To be cured, surgery is the only option. With the VA you’re scheduled only as they’re able to fit you in. Though the four-month wait was bad enough, the distance we had to travel to Vanderbilt Hospital in Nashville was worse. The continual trips grew exhausting. Before I relate of the events of April 18, 2013, let me state right here: Everyone at the hospital was fantastic. Each doctor, nurse, technician, volunteer -anyone that I asked for help willingly and patiently gave their assistance. And I thank them all. April 17 - The night before surgery. While we rested in a motel room about 20 miles away, we watched the local Nashville news. Yikes, there was a bomb scare only about a block from Vanderbilt Hospital. My husband had to fast after midnight. He doesn’t do fasts well. Next morning, light-headed and weak, he drove to Vanderbilt. And we met gridlock traffic. Miles of cars on each enter ramp fought to merge into our lane. What should have been a 30 to 40 minute drive took an hour and a half. Knowing fore-casted severe storms threatened later that evening (we would spend the night in Nashville), we sought a parking garage to shelter our car. We chose the only one we saw across the street. No attendant was anywhere to be found. The money machine said each business day started at midnight. Another driver walked up to pay for his parking slot and we explained our situation, asking were we supposed to be present at midnight to feed the machine its required $10??? He suggested we get a permit from the hospital. Once we arrived at the information desk, what do we learn but that Vanderbilt has their very own parking garage for free and the covered walkway connects right to the hospital. Hubby walked back to where we left the car and spent fifteen minutes driving around on the different levels as he sought to find the ‘exit’. Before his check-in, we visited a social worker office. We inquired for assistance with booking a motel that night. She said she couldn’t do that unless and until he actually became admitted. (the surgery was termed as out-patient) But we were assured that shuttles ran continuously to deliver us to the downtown hotels. Nothing to do then except to check-in. Surgery was scheduled for noon and about ten minutes past they called us to pre-op. Hubby scowled when he learned that he had to strip off and wear the famous split-tail gown. When he wrapped that cloth around him, plus plopped on the ridiculous shower-type cap, and having a face full of unshaved whiskers, I collapsed to my knees in helpless laughter. Because my cell phone didn’t have a camera, that was a missed Kodak moment. Male nurses came in, asked all the usual questions, hooked him up to wires connected to machines that beeped, buzzed, and blinged. At fifteen minutes to one they wheeled him to the operating room. I had no choice but to sit where they directed me. Waiting in the main lobby where all the busy traffic of family, veterans, vendors, and service dogs meet in one noisome knot is sheer Babylon to a hearing-impaired person like myself. And I’m supposed to listen for a surgeon’s phone call in all that chaos? And I wondered what the ‘red’ meant. Not another bomb scare? Five minutes later three uniformed police officers arrived. Tensed and alert, I sat and watched. If orders came to evacuate the building, how in the world could I reach my husband in the operating room? I was told the surgery would last for an hour up to an hour and a half. Time crawled by and I continually glanced at my watch. When two hours passed, I approached the information desk. I again looked at my watch. It showed fifteen till four. I sighed in relief. Sure enough, the young surgeon stepped out of the elevator and came over. She said everything in surgery went well, that my husband’s PTH was now at normal and he should only be in recovery for perhaps an hour and then be released. Again, I waited. The lobby cleared out as visitors and employees left for the day. The helpful man at the desk also disappeared. I was alone except for an occasional volunteer who strolled by. The recovery room was supposed to call when they were ready for me. I scooted a chair over next to the desk so I’d be able to see the line light up. I grew anxious. An hour had already gone by and he wasn’t awake good enough? Another volunteer stopped and asked if she could help. Three times a phone call to recovery was made. Finally, a male volunteer said he’d take me down and allow me to speak with a nurse. That’s exactly what I wanted to do! The nurse assured me my husband was fine, that he was fully awake and coherent. The only thing he needed to do was to urinate. At least this time I was banished to a waiting room only a couple of doors down. About 20 minutes later I received the call - hubby passed the urine test! Though awake, he felt awful. Because of how they must have positioned him on the operating table, his neck killed him. Another volunteer wheeled him to pharmacy to pick up his pain medication, then she left us at the front doors and called for the downtown shuttle. The hotel was probably three or four blocks away and the drive no more then ten or fifteen minutes. We waited for two hours! A different volunteer called twice, I made 3 phone calls of my own. Hubby was in torment. He needed to lie down, but he was forced to remain upright. What kept that blasted driver??? It was now about 7 p.m. I saw a man walking from the parking lot and recognized his employee badge. I grabbed him and asked for help. He was in disbelief that we’d waited so long. He wheeled us to the Emergency department and had the worker there to call, once again, for the driver. It took almost an hour -and a couple of repeat calls- before the van pulled up. This driver said he’d only received the call, so why the other driver ignored our calls, I don’t know. This driver was helpful and sympathetic. We got on the top floor, the fourth floor and -do you believe it- the elevator didn’t work! Poor hubby, weak from hunger, weak from surgery, weak from pain, forced his legs to carry him up those flights of stairs. When I opened the door, I met darkness and cold air. It took several minutes groping in the dark to find a light switch. After flipping the temp control to heat, I helped eased hubby down on a bed. It was 8:10 before this man was able to get the rest he so needed. I’ll gladly handle the promotion/marketing insecurity of a writing job any old day as compared to the stress and worry of out-of-town/bomb scare/code red/garage hunting/urine testing/shuttle-driver-nowhere-to-be-found/elevator-not-working event that I endured on April 18. And, oh…good thing we decided against a shower in that hotel room. There was no hot water. Oh gosh what a performance! I love the way you've kept your sense of humour though and even managed to tie it in with the perhaps-not-so-bad-after-all trauma of author promotion! You made what could have been a rather dry if informative post really interesting and entertaining and I even giggled in a couple of places, althougn it must have been such a strain for both of you. I'm glad it's all over and hope hubby is now well on the way to recovery. Sorry you had such a stressful time at Vanderbuilt. Our son had several surgeries there 15 years ago and it was a great experience. There's no excuse for you being uninformed. They should have had someone assigned to walk you through the experience. It is an excellent hospital though and I"m glad the surgery was a success. Oh, how I can relate! I'm so relieved everything worked out and that your husband is now recovering. I agree with you: hate promotion but will take it any day compared to medical scares. Danielle, yes, Vanderbilt is excellent and one of the top in the nation. The very worst part was when the shuttle didn't arrive. Upon pondering, we believe the driver might have been close to ending his shift and simply ignored his calls. The man who did pick us up answered the call right away, and he was excellent about getting us to the hotel ASAP. But the whole experience is something I never want to repeat! LOL, gray hairs??? I sprouted about 10,000 that day! Oh, Miss Mae, I am so sorry for you. It's a battleground. I know, I went through it for 4 1/2 years with my husband. One of our other author friends now entering the fray says she has picked up her cape and her sword. She'll need chain mail, too. Thank God it's over and I sincerely hope your husband is recovering in comfort. The trama of a loved one going through surgery is enough to deal with without having to go through all the other stuff. I tensed up just reading about it. LOL! I can only imagine the relief you felt on your way back home. Hope your husband recovers quickly. Yes, "battleground" is the word indeed. And sometimes those dragons appear when we least expect them. My very best to you, and to the new author. Yes, we're both so glad to have this behind us. It'll be two weeks tomorrow and he can definitely say today that he's on the mend. Thank you, sweet friend, for being there for me and propping me up with your support. Hi, visiting from the IWSG. I agree with you that promotion/marketing is way easier on our nerves than the hospital trauma you underwent. OMG what a freaking nightmare! I wanted to scream at the world FOR YOU. The GREAT thing is your hubby's good and everything went well. And yeah, what we have to do as writers is a cake walk in comparison! Your husband will feel MUCH better soon. I had a parathyroidectomy in 2004, my mom in 2005, and my husband last year. And it's not catching, but rather rare! The worst thing about it was telling friends that I had to have a PARAthyroidectomy and then having to listen to all the stories about THYroid issues. I would stop and kindly say it was different, but no one has heard of it. In fact, I diagnosed my mom's condition before her specialist did! Your husband will be very glad he had the op. If he had osteopenia it will disappear after a year or two and his energy will leap back. I'm just sorry it was so traumatic for you all. Patricia, thank you for feeling my pain! Though it eventually ended well, I had some anxious moments wondering, that's for sure! Yes, that's true, trying to get folks to understand it's NOT a thyroid issue. Though I'd not heard of it before, after checking, I was surprised to learn that it's as common as it is. And my husband has osteoporosis, a pretty severe case. He's right now 10 1/2 times more likely to break a bone than a normal adult male. The endoc assured him that this would improve rapidly. Oh my Oh my, What a to-do. Cor luv a duck! Hey, look at you - finding the silver lining even in that ordeal. I was thinking about you and your husband and was going to email you so I'm glad you posted about the surgery and more. :) Great post and that's great the surgery was successful and now it's over You certainly had a lot to deal with and even the hotel elevator didn't work. When our son Bart had his hand surgery, it was awful they never told us what was going on. Also they never gave him pain medication before he was discharged and while I was driving him home, my big strong son cried out in pain. It was awful - also the a/c stopped working in the hospital so he was so sweaty when he was discharged. I was afraid he'd have a second hand surgery and didn't want him to have to go to this hospital again. The doctor decided it might cause more damage to remove scar tissue from his hand so never had the second surgery. And I never heard of parathyroid disease. BIG HUG, Miss Mae. I'm so sorry the two of you had to go through all of this, but I'm glad hubby's fine now, and it's all behind you. No wonder you slept so much when you got home! I'm going to add my best wishes to your hubby - and can you pass on my appreciatian and thanks for his service to our country. What an adventure-THis sounds like me running back and forth to Paducah with my hubby but you just got me to thinking. He has high calcium levels which they gave him medicine for and some med for his throid but he has the same symptons as your hubby I may just have to tell the dr. about this. Hope you nad hubby are doing alot better now. So happy to hear your hubby is doing well after his ordeal. Never heard of such a surgery. I didn't know we even had a parathyroid. We've met the same folks during our VA experiences-really sweet caring folks and those unfriendly ones who think they are working at an assembly line instead of a medical CARE center. Enjoyed your account of the experience and even giggled at some of it...I'm sure it was this funny as you lived through it. Walk 4 flights of stairs after surgery? I think your man is Superman!! God bless. Oh, poor Bart! I can't imagine what that fellow went through! I hope he's all healed from that now. LOL, YES, it was like I hadn't slept in all these months beforehand! (When I think about it, I believe I really didn't). But once the weight is off your shoulders, you just plunge into deep soothing sleep. Absolutely, be sure your doctor checks the calcium level. It should not be above 10.0 Even if it's 10.2, that's a red flag. Don't allow the doctor to say, "we'll keep an eye on this" because the calcium will NOT go down. 'Keeping an eye' only means they watch as the calcium continues to rise. What a terrible experience for you both! \I'm glad the people you dealt with were so nice - that must have been some comfort at least. I hope your husband is recovering well. I'm with you. Never heard of parathyroid until this happened to us. There are four parathyroid glands, two on each side of the neck. When one goes haywire, the other three go 'to sleep'. After the bad one is removed, one will then wake up and function as it's supposed to. What happens is the tumor makes the gland produce too much PTH (parathyroid hormone). It's supposed to monitor the calcium in our blood and maintain that tight ratio. But it ignores the numbers and simply produces more and more PTH, which what that does is deposit huge amounts of calcium into the bloodstream. And it does that by robbing calcium from the bones. Calcium lodges in the kidneys, brain, heart, etc. A person either develops kidney stones and kidney disease or suffers a heart attack or stroke. Hubby did get osteoporosis and this made his bones hurt. The saying associated with Parathyroid disease is, "moans, groans, stones and bones". Hubby had all of those except for the stones. I advise everyone now: ALWAYS check your calcium level in every blood test. Anything above 10. is a warning sign. One of my friends had hyperparathyroidism as a teen/adult. In the end, she had multiple surgeries over several years to remove them. IIRC, she said most people have 4 glands, a few people have 8, and so far they'd removed 9 of her parathyroid glands. No wonder they were overactive! I think that helped her overall health, and I hope treatment does the same for your DH! Miss Mae, How awful that you had to go through all these aggravations when your husband was weak and sick. That old saying, "When It Rains It Pours," applies here. I know about waiting...and waiting for a family member to come out of surgery. The wait feels like eternity if you don't have someone to keep you company...and keep you focused on something else. And the trolley delay reminded me of the 1 hr. 45 min. wait my mom and I had after her last doctor visit. The transit van was called three times to pick us up. One time the van stopped and I quickly rolled Mom outside. As soon as I wheeled her chair around the van sped off. We later found out that, on the spur of the moment, the driver decided to take his other passenger home (15 miles away.) Arrrggghhh! I'm so glad that you made it home without incident and that hubby is getting better and better, though slowly. God was watching over and still is. I hope he recovers quickly. After an experience like that, I would say you both need rest. OH DARLIN', I do so feel for you!! Having been through the VA system (with the Augusta Hospital though it's 100 plus miles from us) for hubby's first cataract surgery, I understood and sympathized with every WORD!!! When his second cataract popped up a few years later, the VA center 30 miles from us in Dublin had started contracting the surgery out to local opthamologists and the difference was like traveling into outerspace! Nothing to it! But the wonderful thing is it's DONE and y'all have a new lease on life because he'll be able to enjoy it so much better! Love You!! Don't be silly! Like we don't vent to you? What are friends for and what would we do without each other? Love!